Adam graduated from Appalachian State University with a B.A. in Communications and a concentration Electronic Media and Broadcasting with a minor in Business Management. He co-hosts The Afternoon Drive with Rhonda Lacey each weekday from 3-7. Corporately, Adam serves as the Director of Audio Production for Positive Alternative Radio, leading the PAR group to create and deliver experiences that inspire listeners to live passionately for Jesus Christ. His career in radio started in 2009 as Joy FM’s Promotions Director. He was also the afternoon co-host of lifelong friend Luann Prater. Adam has returned to the Southern Gospel airwaves once more…this time with Tennessee native, Rhonda Lacey. 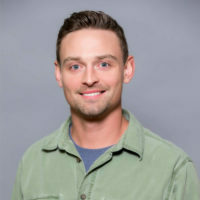 Beyond PAR and Joy FM, Adam invests his time and talents as Secretary on the board of Campus Christian Fellowship at Appalachian State University. Adam enjoys hiking with his wife Katie and their dog, Boone.